Does the Ganges have a future? That’s the question posed by River of Life, River of Death: The Ganges and India’s Future by journalist and author, Victor Mallet. From 2012 to 2016 Victor was based in New Delhi as the Financial Times South Asia bureau chief, and he is currently in Hong Kong as the paper’s Asia news editor. 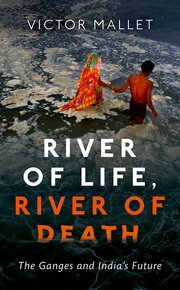 Victor’s new book exposes an environmental crisis of international significance, with revelations about extreme levels of pollution, antibiotic resistance, droughts, and floods - the Goddess Ganga, the holy waterway that has nourished more people than any on earth for three millennia, is now so polluted with sewage and toxic waste that it has become a menace to human and animal health. As he documents the degradation, Victor traces the holy river from source to mouth, and from ancient times to the present day. During four years of first-hand reporting, he encounters everyone from the naked holy men who worship the river, to the engineers who divert its waters for irrigation, to the scientists who study its bacteria - not forgetting Narendra Modi, the Hindu nationalist prime minister, who says he wants to save India's mother-river for posterity. As one Hindu sage told Victor in Rishikesh, on the banks of the Upper Ganges: "If Ganga dies, India dies. If Ganga thrives, India thrives. The lives of 500 million people is no small thing." And the lives of animals relying on the Ganges are no small thing, either. In this guest post, Victor calls for a revival of the wildlife-protection decree of the Emperor Ashoka, from the third century BC. One of the last places I expected to see dolphins was in the centre of Patna, an Indian city the size of Rome that lies hundreds of kilometres from the sea in the landlocked state of Bihar. Yet there they were one morning, freshwater dolphins with their peculiarly long, toothed snouts, fishing in the Ganges, in water strewn with garbage, near what looked like a sewer outfall. Unlike many marine dolphin species, Platanista gangetica gangetica is not particularly playful in the company of humans and rarely leaps far out of the water; surprisingly few Indians, let alone foreigners, know that they can easily be seen a long way upstream on India’s holy river and its tributaries. I was visiting Patna to do some research for my new book on the Ganges, and because I had by then been living in India for a few years I was already aware of the richness of the country’s flora and fauna. India is among the large nations most densely populated by humans, but the traditions of Hinduism and Buddhism have bequeathed a respect for other species - or at least a measure of tolerance - rarely found in other societies. You can see wild sarus, cranes, the world’s tallest birds, mincing along next to big factories and paper mills in the busy fields of Uttar Pradesh. In the green heart of Delhi, now a megacity of around 25 million inhabitants, we routinely saw and heard the creatures immortalised in Rikki-Tikki-Tavi, the Rudyard Kipling tale from The Jungle Book: the eponymous mongoose himself, Darzee the tailorbird, the coppersmith barbet (a bird with a call “like the beating of a hammer on a copper pot”, as Kipling explains) and Chuchundra, the muskrat who is too scared to cross a room and so walks along the walls - but not, thankfully, Nag the cobra and his evil wife Nagaina. Because we lived next to a park, we were visited daily by hornbills and golden-backed woodpeckers. Not bad for a metropolis, and a sharp contrast to the wildlife-bereft cities of modern China. The Gangetic dolphin may be endangered, but the Baiji, the Chinese river dolphin of the Yangtze, was declared extinct a decade ago in the first global extinction of a megafauna species for half a century. Still, I don’t want to romanticise Indian attitudes to nature or minimise the grave problems facing the wildlife of the Ganges and the rest of India. It is true that India can justly boast of the wealth of its natural resources and national parks - from the Himalayan haunts of the snow leopard to the tiger-infested mangrove swamps of the Sunderbans (the beautiful forest) at the Ganges delta in the Bay of Bengal. But it is also true that these riches are under constant threat. The most serious danger is the pressure of human population growth and the relentless destruction of natural habitats. Just after independence in 1947, when the Indian population was over 300 million, S.H. Prater, who had been curator of the Bombay Natural History Society, lamented in his field guide to mammals “the disastrous effect on the wildlife of the country” of human encroachment. Today the population of over 1.3 billion is four times as large, and India is poised to overtake China as the world’s most populous nation. Property developers are constructing apartment blocks and villas ever higher into the Himalayan foothills for wealthy Indians who seek to escape the summer heat. Hundreds of thousands of careless pilgrims strew the mountains paths with garbage, while herb collectors strip the slopes bare of rare plants, and poachers hunt leopards, musk deer and black bears. Then there are the poisons we deliberately or accidentally dump in the environment. Vultures, ubiquitous across India until the 1990s, even in Delhi and Mumbai, were all but exterminated by diclofenac, a drug used to treat inflammation in humans and cattle. The birds - considered essential for the death ceremonies of India’s Zoroastrian Parsis, who expose their dead, on towers of silence, to be devoured and recycled - died of kidney failure after feeding from the carcasses of dead cows treated with the drug. As for the Gangetic dolphins - known as water hogs by the Emperor Babur and locally called susu because of the noise they make when breathing - they face a multiplicity of threats from over-extraction of river water for irrigation, disruptive sand-mining for the construction industry, overfishing, and an onslaught of sewage, industrial waste and the run-off from the fertilisers and pesticides used in the fields of north India. It is time to revive the wildlife-protection decree of the Emperor Ashoka from the third century BC. “I forbade,” he said in his fifth edict inscribed on pillars planted across his empire, “the killing of the following species of animals, namely: parrots, mainas, red-headed ducks, cakravaka-geese, swans, nandi-mukhas , pigeons, bats, ants, tortoises, boneless fish, vedaveyakas, pupulas of the Ganges, skate, porcupines, squirrels, deer, lizards, domesticated animals, rhinoceroses, white pigeons, domestic pigeons and all quadrupeds which are of no utility and are not eaten.” The pupulas of the Ganges, it is thought, are the river dolphins that have survived as a species to this day. Details: River of Life, River of Death: The Ganges and India’s Future is published in hardback and eBook by Oxford University Press, priced in local currencies.